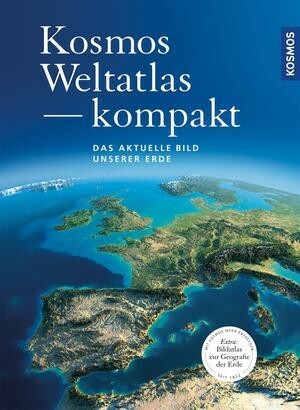 Product information "Kosmos Weltatlas kompakt"
Authoritative yet accessible, general-purpose and practical, the Kosmos Compact Atlas of the World combines the optimal features of size, format, coverage, background information, scale and detail to make it the ideal reference atlas for every home. Fast access to information comes in a convenient form for all readers. Regions of greatest cultural or historical interest are presented at a detailed scale of 1:5 million, while remoter areas are mapped at a scale of 1:15 or 1:17 million. Thematic pages on geology, climate, population and culture for each continent and a 46-pages encyclopaedia of Basic Geography round off the atlas. Languages available: Arabic, Bulgarian, Chinese simpl., Croatian, Czech, Dutch, English, French, German, Hindi, Hungarian, Japanese, Macedonian, Mongolian, Norwegian, Polish, Portuguese, Russian, Serbian, Slovakian, Slovenian, Spanish.